(NOTE: The following has been tested on Ubuntu 8.04 and 10.04 for both 32bit and 64bit installations. Edit the ".bashrc" file, located in your home directory, and append the related environment libraries. Locate the "GNUstep.sh" file (e.g. /usr/share/GNUstep/Makefiles/GNUstep.sh) and append it at your ".bashrc". In that way you will get all the GNUstep environment variables into your profile. The path is preceded by a dot and a space character! Exit the terminal and re-open it. This will force the ".bashrc" to execute with the GNUstep environment variables. This will create '.Oolite' and '.Oolite/AddOns' directories. NOTE: All the add-ons, to be used by the Oolite you are about to build, should be placed here! The 'Logs' directory will be automatically generated upon first run in .Oolite directory. Open a terminal window and make a folder (e.g. Oolite-dev) at your home directory. CD into that directory. This will create a "1.75.3" directory, where the v1.75.3 source files will reside. This will create a "trunk" directory, where the latest 1.75.3 bug-fix source files will reside. Last edited by Getafix on Tue Jan 16, 2018 3:55 pm, edited 37 times in total. You know those who, having been mugged and stabbed, fired, dog run over, house burned down, wife eloped with best friend, daughters becoming prostitutes and their countries invaded - still say that "all is well"? I'm obviously not one of them. Imagine what a conversation with me would be like! …but only because I could’t find GNUstep.sh. I recommend doing it properly. The advantage of that is that you can then update to a hypothetical 1.71.3 without downloading all the unchanged stuff again. Last edited by JensAyton on Mon Nov 03, 2008 10:27 pm, edited 1 time in total. The first post is now updated to include your feedback. I followed this manual step by step.
.:3: validity error : Validation failed: no DTD found ! 2008-05-25 13:57:56.674 oolite [log.header]: Opening log for Oolite version 1.65 (x86-32 test release) under Linux at 2008-05-25 13:57:56 +0200. 2008-05-25 13:57:56.994 oolite [dataCache.found]: Found data cache. 2008-05-25 13:57:56.994 oolite [dataCache.rebuild]: Data cache version (1.72) does not match Oolite version (1.65), rebuilding cache. 2008-05-25 13:57:56.000 oolite [oxp.versionMismatch]: OXP /home/ebw/.Oolite/AddOns/System_Redux.oxp is incompatible with version 1.65 of Oolite. 2008-05-25 13:57:57.003 oolite [oxp.versionMismatch]: OXP /home/ebw/.Oolite/AddOns/buoyRepair1.00.oxp is incompatible with version 1.65 of Oolite. 2008-05-25 13:57:57.008 oolite [dataCache.retrieve.failed]: Failed to retreive"search path modification dates" cache object search paths -- no such cache. 2008-05-25 13:57:57.009 oolite [dataCache.set.success]: Updated entry search paths in cache "search path modification dates". 2008-05-25 13:57:57.009 oolite [dataCache.set.success]: Updated entry modification dates in cache "search path modification dates". 2008-05-25 13:57:57.010 oolite [dataCache.retrieve.failed]: Failed to retreive"dictionaries" cache object Config/descriptions.plist merge:basic -- no such cache. 2008-05-25 13:57:57.030 oolite [dataCache.set.success]: Updated entry Config/descriptions.plist merge:basic in cache "dictionaries". 2008-05-25 13:57:57.030 oolite [dataCache.retrieve.failed]: Failed to retrieve "dictionaries" cache object Config/shipdata.plist merge:basic -- no such entry. 2008-05-25 13:57:57.622 oolite [dataCache.set.success]: Updated entry Config/shipdata.plist merge:basic in cache "dictionaries". 2008-05-25 13:57:57.622 oolite [dataCache.retrieve.failed]: Failed to retrieve "dictionaries" cache object Config/shipyard.plist merge:basic -- no such entry. 2008-05-25 13:57:57.713 oolite [dataCache.set.success]: Updated entry Config/shipyard.plist merge:basic in cache "dictionaries". 2008-05-25 13:57:57.714 oolite [dataCache.retrieve.failed]: Failed to retrieve "dictionaries" cache object Config/commodities.plist merge:basic -- no such entry. 2008-05-25 13:57:57.731 oolite [dataCache.set.success]: Updated entry Config/commodities.plist merge:basic in cache "dictionaries". 2008-05-25 13:57:57.731 oolite [dataCache.retrieve.failed]: Failed to retrieve "dictionaries" cache object Config/illegal_goods.plist merge:basic -- no such entry. 2008-05-25 13:57:57.733 oolite [dataCache.set.success]: Updated entry Config/illegal_goods.plist merge:basic in cache "dictionaries". 2008-05-25 13:57:57.733 oolite [dataCache.retrieve.failed]: Failed to retrieve "dictionaries" cache object Config/characters.plist merge:basic -- no such entry. 2008-05-25 13:57:57.735 oolite [dataCache.set.success]: Updated entry Config/characters.plist merge:basic in cache "dictionaries". 2008-05-25 13:57:57.735 oolite [dataCache.retrieve.failed]: Failed to retrieve "dictionaries" cache object Config/customsounds.plist merge:basic -- no such entry. 2008-05-25 13:57:57.738 oolite [dataCache.set.success]: Updated entry Config/customsounds.plist merge:basic in cache "dictionaries". 2008-05-25 13:57:57.738 oolite [dataCache.retrieve.failed]: Failed to retreive"resolved paths" cache object Sounds/witch_fail_fuel.ogg -- no such cache. 2008-05-25 13:57:57.738 oolite [dataCache.set.success]: Updated entry Sounds/witch_fail_fuel.ogg in cache "resolved paths". 2008-05-25 13:57:57.750 oolite [dataCache.retrieve.failed]: Failed to retrieve "resolved paths" cache object Sounds/mis_launch.ogg -- no such entry. 2008-05-25 13:57:57.751 oolite [dataCache.set.success]: Updated entry Sounds/mis_launch.ogg in cache "resolved paths". 2008-05-25 13:57:58.715 oolite [dataCache.retrieve.failed]: Failed to retrieve "resolved paths" cache object Sounds/auto_fail.ogg -- no such entry. 2008-05-25 13:57:58.716 oolite [dataCache.set.success]: Updated entry Sounds/auto_fail.ogg in cache "resolved paths". 2008-05-25 13:57:58.729 oolite [dataCache.retrieve.failed]: Failed to retrieve "resolved paths" cache object Sounds/mine-armed.ogg -- no such entry. 2008-05-25 13:57:58.730 oolite [dataCache.retrieve.failed]: Failed to retrieve "resolved paths" cache object Sounds/mis_armed.ogg -- no such entry. 2008-05-25 13:57:58.731 oolite [dataCache.set.success]: Updated entry Sounds/mis_armed.ogg in cache "resolved paths". 2008-05-25 13:57:58.741 oolite [dataCache.retrieve.failed]: Failed to retrieve "resolved paths" cache object Sounds/id_on.ogg -- no such entry. 2008-05-25 13:57:58.741 oolite [dataCache.set.success]: Updated entry Sounds/id_on.ogg in cache "resolved paths". 2008-05-25 13:57:58.749 oolite [dataCache.retrieve.failed]: Failed to retrieve "resolved paths" cache object Sounds/mis_lock.ogg -- no such entry. 2008-05-25 13:57:58.749 oolite [dataCache.set.success]: Updated entry Sounds/mis_lock.ogg in cache "resolved paths". 2008-05-25 13:57:58.756 oolite [dataCache.retrieve.failed]: Failed to retrieve "resolved paths" cache object Sounds/cloak_on.ogg -- no such entry. 2008-05-25 13:57:58.756 oolite [dataCache.set.success]: Updated entry Sounds/cloak_on.ogg in cache "resolved paths". 2008-05-25 13:57:58.764 oolite [dataCache.retrieve.failed]: Failed to retrieve "resolved paths" cache object Sounds/id_lock.ogg -- no such entry. 2008-05-25 13:57:58.764 oolite [dataCache.set.success]: Updated entry Sounds/id_lock.ogg in cache "resolved paths". 2008-05-25 13:57:58.771 oolite [dataCache.retrieve.failed]: Failed to retrieve "resolved paths" cache object Sounds/ws_malf.ogg -- no such entry. 2008-05-25 13:57:58.771 oolite [dataCache.set.success]: Updated entry Sounds/ws_malf.ogg in cache "resolved paths". 2008-05-25 13:57:58.789 oolite [dataCache.retrieve.failed]: Failed to retrieve "resolved paths" cache object Sounds/auto_deny.ogg -- no such entry. 2008-05-25 13:57:58.790 oolite [dataCache.set.success]: Updated entry Sounds/auto_deny.ogg in cache "resolved paths". 2008-05-25 13:57:58.798 oolite [dataCache.retrieve.failed]: Failed to retrieve "resolved paths" cache object Sounds/cloak_off.ogg -- no such entry. 2008-05-25 13:57:58.799 oolite [dataCache.set.success]: Updated entry Sounds/cloak_off.ogg in cache "resolved paths". 2008-05-25 13:57:58.807 oolite [dataCache.retrieve.failed]: Failed to retrieve "resolved paths" cache object Sounds/fuel-leak.ogg -- no such entry. 2008-05-25 13:57:58.808 oolite [dataCache.set.success]: Updated entry Sounds/fuel-leak.ogg in cache "resolved paths". 2008-05-25 13:57:58.824 oolite [dataCache.retrieve.failed]: Failed to retrieve "resolved paths" cache object Sounds/auto_off.ogg -- no such entry. 2008-05-25 13:57:58.824 oolite [dataCache.set.success]: Updated entry Sounds/auto_off.ogg in cache "resolved paths". 2008-05-25 13:57:58.844 oolite [dataCache.retrieve.failed]: Failed to retrieve "resolved paths" cache object Sounds/mis_safe.ogg -- no such entry. 2008-05-25 13:57:58.845 oolite [dataCache.set.success]: Updated entry Sounds/mis_safe.ogg in cache "resolved paths". 2008-05-25 13:57:58.851 oolite [dataCache.retrieve.failed]: Failed to retrieve "resolved paths" cache object Sounds/mass_lock.ogg -- no such entry. 2008-05-25 13:57:58.852 oolite [dataCache.set.success]: Updated entry Sounds/mass_lock.ogg in cache "resolved paths". 2008-05-25 13:57:58.858 oolite [dataCache.retrieve.failed]: Failed to retrieve "resolved paths" cache object Sounds/In-missile.ogg -- no such entry. 2008-05-25 13:57:58.858 oolite [dataCache.set.success]: Updated entry Sounds/In-missile.ogg in cache "resolved paths". 2008-05-25 13:57:58.868 oolite [dataCache.retrieve.failed]: Failed to retrieve "resolved paths" cache object Sounds/game_over.ogg -- no such entry. 2008-05-25 13:57:58.869 oolite [dataCache.set.success]: Updated entry Sounds/game_over.ogg in cache "resolved paths". 2008-05-25 13:57:58.891 oolite [dataCache.retrieve.failed]: Failed to retrieve "resolved paths" cache object Sounds/hs_cdown.ogg -- no such entry. 2008-05-25 13:57:58.892 oolite [dataCache.set.success]: Updated entry Sounds/hs_cdown.ogg in cache "resolved paths". 2008-05-25 13:57:58.924 oolite [dataCache.retrieve.failed]: Failed to retrieve "resolved paths" cache object Sounds/mine_L.ogg -- no such entry. 2008-05-25 13:57:58.924 oolite [dataCache.set.success]: Updated entry Sounds/mine_L.ogg in cache "resolved paths". 2008-05-25 13:57:58.946 oolite [dataCache.retrieve.failed]: Failed to retrieve "resolved paths" cache object Sounds/ECM.ogg -- no such entry. 2008-05-25 13:57:58.946 oolite [dataCache.set.success]: Updated entry Sounds/ECM.ogg in cache "resolved paths". 2008-05-25 13:57:58.947 oolite [dataCache.retrieve.failed]: Failed to retrieve "resolved paths" cache object Sounds/witch_fail.ogg -- no such entry. 2008-05-25 13:57:58.947 oolite [dataCache.set.success]: Updated entry Sounds/witch_fail.ogg in cache "resolved paths". 2008-05-25 13:57:58.956 oolite [dataCache.retrieve.failed]: Failed to retrieve "resolved paths" cache object Sounds/hyp_abort.ogg -- no such entry. 2008-05-25 13:57:58.956 oolite [dataCache.set.success]: Updated entry Sounds/hyp_abort.ogg in cache "resolved paths". 2008-05-25 13:57:58.963 oolite [dataCache.retrieve.failed]: Failed to retrieve "resolved paths" cache object Sounds/cargo_jet.ogg -- no such entry. 2008-05-25 13:57:58.964 oolite [dataCache.set.success]: Updated entry Sounds/cargo_jet.ogg in cache "resolved paths". 2008-05-25 13:57:58.973 oolite [dataCache.retrieve.failed]: Failed to retrieve "resolved paths" cache object Sounds/aegis_station.ogg -- no such entry. 2008-05-25 13:57:58.973 oolite [dataCache.set.success]: Updated entry Sounds/aegis_station.ogg in cache "resolved paths". 2008-05-25 13:57:58.982 oolite [dataCache.retrieve.failed]: Failed to retrieve "resolved paths" cache object Sounds/no_memtar.ogg -- no such entry. 2008-05-25 13:57:58.983 oolite [dataCache.set.success]: Updated entry Sounds/no_memtar.ogg in cache "resolved paths". 2008-05-25 13:57:58.989 oolite [dataCache.retrieve.failed]: Failed to retrieve "resolved paths" cache object Sounds/hold_full.ogg -- no such entry. 2008-05-25 13:57:58.990 oolite [dataCache.set.success]: Updated entry Sounds/hold_full.ogg in cache "resolved paths". 2008-05-25 13:57:58.999 oolite [dataCache.retrieve.failed]: Failed to retrieve "resolved paths" cache object Sounds/gh_cdown.ogg -- no such entry. 2008-05-25 13:57:58.999 oolite [dataCache.set.success]: Updated entry Sounds/gh_cdown.ogg in cache "resolved paths". 2008-05-25 13:57:59.060 oolite [dataCache.retrieve.failed]: Failed to retrieve "resolved paths" cache object Sounds/energylow.ogg -- no such entry. 2008-05-25 13:57:59.061 oolite [dataCache.set.success]: Updated entry Sounds/energylow.ogg in cache "resolved paths". 2008-05-25 13:57:59.090 oolite [dataCache.retrieve.failed]: Failed to retrieve "resolved paths" cache object Sounds/aegis_planet.ogg -- no such entry. 2008-05-25 13:57:59.091 oolite [dataCache.set.success]: Updated entry Sounds/aegis_planet.ogg in cache "resolved paths". 2008-05-25 13:57:59.100 oolite [dataCache.retrieve.failed]: Failed to retrieve "resolved paths" cache object Sounds/nosystem.ogg -- no such entry. 2008-05-25 13:57:59.101 oolite [dataCache.set.success]: Updated entry Sounds/nosystem.ogg in cache "resolved paths". 2008-05-25 13:57:59.118 oolite [dataCache.retrieve.failed]: Failed to retrieve "resolved paths" cache object Sounds/id_off.ogg -- no such entry. 2008-05-25 13:57:59.118 oolite [dataCache.set.success]: Updated entry Sounds/id_off.ogg in cache "resolved paths". 2008-05-25 13:57:59.126 oolite [dataCache.retrieve.failed]: Failed to retrieve "resolved paths" cache object Sounds/auto_on.ogg -- no such entry. 2008-05-25 13:57:59.127 oolite [dataCache.set.success]: Updated entry Sounds/auto_on.ogg in cache "resolved paths". 2008-05-25 13:57:59.381 oolite [dataCache.retrieve.failed]: Failed to retrieve "resolved paths" cache object Sounds/pod_scoop.ogg -- no such entry. 2008-05-25 13:57:59.381 oolite [dataCache.set.success]: Updated entry Sounds/pod_scoop.ogg in cache "resolved paths". 2008-05-25 13:57:59.404 oolite [dataCache.retrieve.failed]: Failed to retrieve "resolved paths" cache object Sounds/w_hole.ogg -- no such entry. 2008-05-25 13:57:59.404 oolite [dataCache.set.success]: Updated entry Sounds/w_hole.ogg in cache "resolved paths". 2008-05-25 13:57:59.417 oolite [dataCache.retrieve.failed]: Failed to retrieve "resolved paths" cache object Sounds/weap_heat.ogg -- no such entry. 2008-05-25 13:57:59.417 oolite [dataCache.set.success]: Updated entry Sounds/weap_heat.ogg in cache "resolved paths". 2008-05-25 13:57:59.429 oolite [dataCache.retrieve.failed]: Failed to retrieve "resolved paths" cache object Sounds/auto_norange.ogg -- no such entry. 2008-05-25 13:57:59.430 oolite [dataCache.set.success]: Updated entry Sounds/auto_norange.ogg in cache "resolved paths". 2008-05-25 13:57:59.445 oolite [dataCache.retrieve.failed]: Failed to retrieve "resolved paths" cache object Sounds/tar_lost.ogg -- no such entry. 2008-05-25 13:57:59.446 oolite [dataCache.set.success]: Updated entry Sounds/tar_lost.ogg in cache "resolved paths". 2008-05-25 13:57:59.459 oolite [dataCache.retrieve.failed]: Failed to retrieve "dictionaries" cache object Config/planetinfo.plist merge:smart -- no such entry. 2008-05-25 13:57:59.468 oolite [dataCache.set.success]: Updated entry Config/planetinfo.plist merge:smart in cache "dictionaries". 2008-05-25 13:57:59.468 oolite [dataCache.retrieve.failed]: Failed to retreive"arrays" cache object Config/pirate-victim-roles.plist merge:yes -- no such cache. 2008-05-25 13:57:59.469 oolite [dataCache.retrieve.failed]: Failed to retreive"arrays" cache object Config/equipment.plist merge:yes -- no such cache. 2008-05-25 13:57:59.474 oolite [dataCache.set.success]: Updated entry Config/equipment.plist merge:yes in cache "arrays". 2008-05-25 13:57:59.475 oolite [dataCache.retrieve.failed]: Failed to retrieve "dictionaries" cache object Config/missiontext.plist merge:basic -- no such entry. 2008-05-25 13:57:59.486 oolite [dataCache.set.success]: Updated entry Config/missiontext.plist merge:basic in cache "dictionaries". 2008-05-25 13:57:59.486 oolite [dataCache.retrieve.failed]: Failed to retrieve "arrays" cache object Config/demoships.plist merge:yes -- no such entry. 2008-05-25 13:57:59.496 oolite [dataCache.set.success]: Updated entry Config/demoships.plist merge:yes in cache "arrays". 2008-05-25 13:57:59.497 oolite [dataCache.retrieve.failed]: Failed to retrieve "dictionaries" cache object Config/hud.plist merge:basic -- no such entry. 2008-05-25 13:57:59.501 oolite [dataCache.set.success]: Updated entry Config/hud.plist merge:basic in cache "dictionaries". 2008-05-25 13:57:59.502 oolite [dataCache.retrieve.failed]: Failed to retrieve "dictionaries" cache object Config/oolite-font.plist merge:none -- no such entry. 2008-05-25 13:57:59.503 oolite [dataCache.retrieve.success]: Retrieved "dictionaries" cache object Config/commodities.plist merge:basic. 2008-05-25 13:57:59.503 oolite [dataCache.retrieve.failed]: Failed to retrieve "resolved paths" cache object Textures/trumblekit.png -- no such entry. 2008-05-25 13:57:59.504 oolite [files.notFound]: ----- WARNING: Could not find texture file "trumblekit.png". Used default no textures material instead. 2008-05-25 13:57:59.504 oolite [dataCache.retrieve.failed]: Failed to retrieve "resolved paths" cache object Sounds/trumble.ogg -- no such entry. 2008-05-25 13:57:59.505 oolite [dataCache.retrieve.failed]: Failed to retrieve "resolved paths" cache object Sounds/trumblesqueal.ogg -- no such entry. 2008-05-25 13:57:59.506 oolite [dataCache.retrieve.failed]: Failed to retrieve "resolved paths" cache object Textures/trumblekit.png -- no such entry. 2008-05-25 13:57:59.507 oolite [files.notFound]: ----- WARNING: Could not find texture file "trumblekit.png". Used default no textures material instead. 2008-05-25 13:57:59.507 oolite [dataCache.retrieve.failed]: Failed to retrieve "resolved paths" cache object Sounds/trumble.ogg -- no such entry. 2008-05-25 13:57:59.508 oolite [dataCache.retrieve.failed]: Failed to retrieve "resolved paths" cache object Sounds/trumblesqueal.ogg -- no such entry. 2008-05-25 13:57:59.509 oolite [dataCache.retrieve.failed]: Failed to retrieve "resolved paths" cache object Textures/trumblekit.png -- no such entry. 2008-05-25 13:57:59.510 oolite [files.notFound]: ----- WARNING: Could not find texture file "trumblekit.png". Used default no textures material instead. 2008-05-25 13:57:59.511 oolite [dataCache.retrieve.failed]: Failed to retrieve "resolved paths" cache object Sounds/trumble.ogg -- no such entry. 2008-05-25 13:57:59.511 oolite [dataCache.retrieve.failed]: Failed to retrieve "resolved paths" cache object Sounds/trumblesqueal.ogg -- no such entry. 2008-05-25 13:57:59.512 oolite [dataCache.retrieve.failed]: Failed to retrieve "resolved paths" cache object Textures/trumblekit.png -- no such entry. 2008-05-25 13:57:59.513 oolite [files.notFound]: ----- WARNING: Could not find texture file "trumblekit.png". Used default no textures material instead. 2008-05-25 13:57:59.514 oolite [dataCache.retrieve.failed]: Failed to retrieve "resolved paths" cache object Sounds/trumble.ogg -- no such entry. 2008-05-25 13:57:59.514 oolite [dataCache.retrieve.failed]: Failed to retrieve "resolved paths" cache object Sounds/trumblesqueal.ogg -- no such entry. 2008-05-25 13:57:59.516 oolite [dataCache.retrieve.failed]: Failed to retrieve "resolved paths" cache object Textures/trumblekit.png -- no such entry. 2008-05-25 13:57:59.517 oolite [files.notFound]: ----- WARNING: Could not find texture file "trumblekit.png". Used default no textures material instead. 2008-05-25 13:57:59.517 oolite [dataCache.retrieve.failed]: Failed to retrieve "resolved paths" cache object Sounds/trumble.ogg -- no such entry. 2008-05-25 13:57:59.518 oolite [dataCache.retrieve.failed]: Failed to retrieve "resolved paths" cache object Sounds/trumblesqueal.ogg -- no such entry. 2008-05-25 13:57:59.519 oolite [dataCache.retrieve.failed]: Failed to retrieve "resolved paths" cache object Textures/trumblekit.png -- no such entry. 2008-05-25 13:57:59.520 oolite [files.notFound]: ----- WARNING: Could not find texture file "trumblekit.png". Used default no textures material instead. 2008-05-25 13:57:59.520 oolite [dataCache.retrieve.failed]: Failed to retrieve "resolved paths" cache object Sounds/trumble.ogg -- no such entry. 2008-05-25 13:57:59.521 oolite [dataCache.retrieve.failed]: Failed to retrieve "resolved paths" cache object Sounds/trumblesqueal.ogg -- no such entry. 2008-05-25 13:57:59.522 oolite [dataCache.retrieve.failed]: Failed to retrieve "resolved paths" cache object Textures/trumblekit.png -- no such entry. 2008-05-25 13:57:59.523 oolite [files.notFound]: ----- WARNING: Could not find texture file "trumblekit.png". Used default no textures material instead. 2008-05-25 13:57:59.523 oolite [dataCache.retrieve.failed]: Failed to retrieve "resolved paths" cache object Sounds/trumble.ogg -- no such entry. 2008-05-25 13:57:59.524 oolite [dataCache.retrieve.failed]: Failed to retrieve "resolved paths" cache object Sounds/trumblesqueal.ogg -- no such entry. 2008-05-25 13:57:59.525 oolite [dataCache.retrieve.failed]: Failed to retrieve "resolved paths" cache object Textures/trumblekit.png -- no such entry. 2008-05-25 13:57:59.526 oolite [files.notFound]: ----- WARNING: Could not find texture file "trumblekit.png". Used default no textures material instead. 2008-05-25 13:57:59.526 oolite [dataCache.retrieve.failed]: Failed to retrieve "resolved paths" cache object Sounds/trumble.ogg -- no such entry. 2008-05-25 13:57:59.527 oolite [dataCache.retrieve.failed]: Failed to retrieve "resolved paths" cache object Sounds/trumblesqueal.ogg -- no such entry. 2008-05-25 13:57:59.528 oolite [dataCache.retrieve.failed]: Failed to retrieve "resolved paths" cache object Textures/trumblekit.png -- no such entry. 2008-05-25 13:57:59.529 oolite [files.notFound]: ----- WARNING: Could not find texture file "trumblekit.png". Used default no textures material instead. 2008-05-25 13:57:59.529 oolite [dataCache.retrieve.failed]: Failed to retrieve "resolved paths" cache object Sounds/trumble.ogg -- no such entry. 2008-05-25 13:57:59.530 oolite [dataCache.retrieve.failed]: Failed to retrieve "resolved paths" cache object Sounds/trumblesqueal.ogg -- no such entry. 2008-05-25 13:57:59.531 oolite [dataCache.retrieve.failed]: Failed to retrieve "resolved paths" cache object Textures/trumblekit.png -- no such entry. 2008-05-25 13:57:59.532 oolite [files.notFound]: ----- WARNING: Could not find texture file "trumblekit.png". Used default no textures material instead. 2008-05-25 13:57:59.532 oolite [dataCache.retrieve.failed]: Failed to retrieve "resolved paths" cache object Sounds/trumble.ogg -- no such entry. 2008-05-25 13:57:59.533 oolite [dataCache.retrieve.failed]: Failed to retrieve "resolved paths" cache object Sounds/trumblesqueal.ogg -- no such entry. 2008-05-25 13:57:59.534 oolite [dataCache.retrieve.failed]: Failed to retrieve "resolved paths" cache object Textures/trumblekit.png -- no such entry. 2008-05-25 13:57:59.535 oolite [files.notFound]: ----- WARNING: Could not find texture file "trumblekit.png". Used default no textures material instead. 2008-05-25 13:57:59.535 oolite [dataCache.retrieve.failed]: Failed to retrieve "resolved paths" cache object Sounds/trumble.ogg -- no such entry. 2008-05-25 13:57:59.536 oolite [dataCache.retrieve.failed]: Failed to retrieve "resolved paths" cache object Sounds/trumblesqueal.ogg -- no such entry. 2008-05-25 13:57:59.537 oolite [dataCache.retrieve.failed]: Failed to retrieve "resolved paths" cache object Textures/trumblekit.png -- no such entry. 2008-05-25 13:57:59.538 oolite [files.notFound]: ----- WARNING: Could not find texture file "trumblekit.png". Used default no textures material instead. 2008-05-25 13:57:59.538 oolite [dataCache.retrieve.failed]: Failed to retrieve "resolved paths" cache object Sounds/trumble.ogg -- no such entry. 2008-05-25 13:57:59.539 oolite [dataCache.retrieve.failed]: Failed to retrieve "resolved paths" cache object Sounds/trumblesqueal.ogg -- no such entry. 2008-05-25 13:57:59.540 oolite [dataCache.retrieve.failed]: Failed to retrieve "resolved paths" cache object Textures/trumblekit.png -- no such entry. 2008-05-25 13:57:59.541 oolite [files.notFound]: ----- WARNING: Could not find texture file "trumblekit.png". Used default no textures material instead. 2008-05-25 13:57:59.541 oolite [dataCache.retrieve.failed]: Failed to retrieve "resolved paths" cache object Sounds/trumble.ogg -- no such entry. 2008-05-25 13:57:59.542 oolite [dataCache.retrieve.failed]: Failed to retrieve "resolved paths" cache object Sounds/trumblesqueal.ogg -- no such entry. 2008-05-25 13:57:59.543 oolite [dataCache.retrieve.failed]: Failed to retrieve "resolved paths" cache object Textures/trumblekit.png -- no such entry. 2008-05-25 13:57:59.544 oolite [files.notFound]: ----- WARNING: Could not find texture file "trumblekit.png". Used default no textures material instead. 2008-05-25 13:57:59.545 oolite [dataCache.retrieve.failed]: Failed to retrieve "resolved paths" cache object Sounds/trumble.ogg -- no such entry. 2008-05-25 13:57:59.545 oolite [dataCache.retrieve.failed]: Failed to retrieve "resolved paths" cache object Sounds/trumblesqueal.ogg -- no such entry. 2008-05-25 13:57:59.546 oolite [dataCache.retrieve.failed]: Failed to retrieve "resolved paths" cache object Textures/trumblekit.png -- no such entry. 2008-05-25 13:57:59.547 oolite [files.notFound]: ----- WARNING: Could not find texture file "trumblekit.png". Used default no textures material instead. 2008-05-25 13:57:59.548 oolite [dataCache.retrieve.failed]: Failed to retrieve "resolved paths" cache object Sounds/trumble.ogg -- no such entry. 2008-05-25 13:57:59.548 oolite [dataCache.retrieve.failed]: Failed to retrieve "resolved paths" cache object Sounds/trumblesqueal.ogg -- no such entry. 2008-05-25 13:57:59.549 oolite [dataCache.retrieve.failed]: Failed to retrieve "resolved paths" cache object Textures/trumblekit.png -- no such entry. 2008-05-25 13:57:59.550 oolite [files.notFound]: ----- WARNING: Could not find texture file "trumblekit.png". Used default no textures material instead. 2008-05-25 13:57:59.551 oolite [dataCache.retrieve.failed]: Failed to retrieve "resolved paths" cache object Sounds/trumble.ogg -- no such entry. 2008-05-25 13:57:59.552 oolite [dataCache.retrieve.failed]: Failed to retrieve "resolved paths" cache object Sounds/trumblesqueal.ogg -- no such entry. 2008-05-25 13:57:59.553 oolite [dataCache.retrieve.failed]: Failed to retrieve "resolved paths" cache object Textures/trumblekit.png -- no such entry. 2008-05-25 13:57:59.553 oolite [files.notFound]: ----- WARNING: Could not find texture file "trumblekit.png". Used default no textures material instead. 2008-05-25 13:57:59.554 oolite [dataCache.retrieve.failed]: Failed to retrieve "resolved paths" cache object Sounds/trumble.ogg -- no such entry. 2008-05-25 13:57:59.555 oolite [dataCache.retrieve.failed]: Failed to retrieve "resolved paths" cache object Sounds/trumblesqueal.ogg -- no such entry. 2008-05-25 13:57:59.556 oolite [dataCache.retrieve.failed]: Failed to retrieve "resolved paths" cache object Textures/trumblekit.png -- no such entry. 2008-05-25 13:57:59.556 oolite [files.notFound]: ----- WARNING: Could not find texture file "trumblekit.png". Used default no textures material instead. 2008-05-25 13:57:59.557 oolite [dataCache.retrieve.failed]: Failed to retrieve "resolved paths" cache object Sounds/trumble.ogg -- no such entry. 2008-05-25 13:57:59.558 oolite [dataCache.retrieve.failed]: Failed to retrieve "resolved paths" cache object Sounds/trumblesqueal.ogg -- no such entry. 2008-05-25 13:57:59.559 oolite [dataCache.retrieve.failed]: Failed to retrieve "resolved paths" cache object Textures/trumblekit.png -- no such entry. 2008-05-25 13:57:59.560 oolite [files.notFound]: ----- WARNING: Could not find texture file "trumblekit.png". Used default no textures material instead. 2008-05-25 13:57:59.560 oolite [dataCache.retrieve.failed]: Failed to retrieve "resolved paths" cache object Sounds/trumble.ogg -- no such entry. 2008-05-25 13:57:59.561 oolite [dataCache.retrieve.failed]: Failed to retrieve "resolved paths" cache object Sounds/trumblesqueal.ogg -- no such entry. 2008-05-25 13:57:59.562 oolite [dataCache.retrieve.failed]: Failed to retrieve "resolved paths" cache object Textures/trumblekit.png -- no such entry. 2008-05-25 13:57:59.563 oolite [files.notFound]: ----- WARNING: Could not find texture file "trumblekit.png". Used default no textures material instead. 2008-05-25 13:57:59.563 oolite [dataCache.retrieve.failed]: Failed to retrieve "resolved paths" cache object Sounds/trumble.ogg -- no such entry. 2008-05-25 13:57:59.564 oolite [dataCache.retrieve.failed]: Failed to retrieve "resolved paths" cache object Sounds/trumblesqueal.ogg -- no such entry. 2008-05-25 13:57:59.565 oolite [dataCache.retrieve.failed]: Failed to retrieve "resolved paths" cache object Textures/trumblekit.png -- no such entry. 2008-05-25 13:57:59.566 oolite [files.notFound]: ----- WARNING: Could not find texture file "trumblekit.png". Used default no textures material instead. 2008-05-25 13:57:59.566 oolite [dataCache.retrieve.failed]: Failed to retrieve "resolved paths" cache object Sounds/trumble.ogg -- no such entry. 2008-05-25 13:57:59.567 oolite [dataCache.retrieve.failed]: Failed to retrieve "resolved paths" cache object Sounds/trumblesqueal.ogg -- no such entry. 2008-05-25 13:57:59.568 oolite [dataCache.retrieve.failed]: Failed to retrieve "resolved paths" cache object Textures/trumblekit.png -- no such entry. 2008-05-25 13:57:59.569 oolite [files.notFound]: ----- WARNING: Could not find texture file "trumblekit.png". Used default no textures material instead. 2008-05-25 13:57:59.569 oolite [dataCache.retrieve.failed]: Failed to retrieve "resolved paths" cache object Sounds/trumble.ogg -- no such entry. 2008-05-25 13:57:59.570 oolite [dataCache.retrieve.failed]: Failed to retrieve "resolved paths" cache object Sounds/trumblesqueal.ogg -- no such entry. 2008-05-25 13:57:59.571 oolite [dataCache.retrieve.failed]: Failed to retrieve "resolved paths" cache object Textures/trumblekit.png -- no such entry. 2008-05-25 13:57:59.572 oolite [files.notFound]: ----- WARNING: Could not find texture file "trumblekit.png". Used default no textures material instead. 2008-05-25 13:57:59.572 oolite [dataCache.retrieve.failed]: Failed to retrieve "resolved paths" cache object Sounds/trumble.ogg -- no such entry. 2008-05-25 13:57:59.573 oolite [dataCache.retrieve.failed]: Failed to retrieve "resolved paths" cache object Sounds/trumblesqueal.ogg -- no such entry. 2008-05-25 13:57:59.574 oolite [dataCache.retrieve.failed]: Failed to retrieve "resolved paths" cache object Textures/trumblekit.png -- no such entry. 2008-05-25 13:57:59.575 oolite [files.notFound]: ----- WARNING: Could not find texture file "trumblekit.png". Used default no textures material instead. 2008-05-25 13:57:59.575 oolite [dataCache.retrieve.failed]: Failed to retrieve "resolved paths" cache object Sounds/trumble.ogg -- no such entry. 2008-05-25 13:57:59.576 oolite [dataCache.retrieve.failed]: Failed to retrieve "resolved paths" cache object Sounds/trumblesqueal.ogg -- no such entry. 2008-05-25 13:57:59.577 oolite [dataCache.retrieve.failed]: Failed to retrieve "dictionaries" cache object AIs/dockingAI.plist merge:none -- no such entry. 2008-05-25 13:57:59.578 oolite [script.debug.replaceVariablesInString]: EXPANSION: "system-description-string" becomes "system-description-string"
followed your manual with the tar.bz2 which can be downloaded from berlios. No svn here. Now everything seems to work. The game just crashed a bit often before I remove RandomHits OXP. Cut and pasted from your post. Tried Package Manager too. If I search for "gobjc" it doesn't find anything. I'm on U 7.10 is this the issue? make: *** No rule to make target `/objc.make'. Stop. Something seems to be wrong with the GNUstep installation. 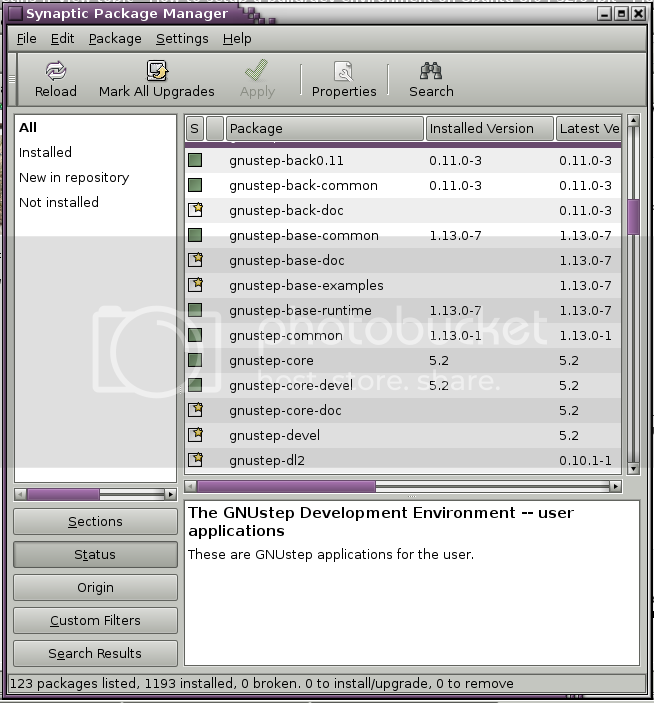 Below the Dependencies: line, there are the version numbers of the software needed in parenthesis, but for gnustep-common and gnustep-make-common these are null. In fact, judging from the error you get at the end, it looks like gnustep-make has not been installed at all. I have already emailed winston about the situation and I hope that a new Linux installer will be up soon. Anything I can do in the meantime? I was never this adventurous with Fiesty so, while I consider myself technically competent, this is new territory for me. Is there some way I can install GNUstep properly? As I am not a Linux user, I cannot really be of much help. The only thing I could recommend to do is to use the Synaptic Package Manager to install GNUstep instead of the command line (not sure which method you used). I have seen Synaptic in action and it does install GNUstep correctly. Just make sure that you get gnustep-base with all its dependencies.